Palestinian environmental networks and professional unions call on MedPine to relocate its conference outside of Israel and urge invited speakers to refuse to lend their scholarship to KKL-JNF’s greenwashing of Israel’s violations of Palestinian human rights. In November of last year, the UN General Assembly designated 2014 as the UN International Year of Solidarity with the Palestinian people. Just three weeks into 2014, the boycott, divestment and sanctions (BDS) movement has again shown that it represents an increasingly effective form of solidarity with the Palestinian struggle for freedom, justice and equality. This round-up was published in conjunction with a Palestinian BDS National Committee statement looking ahead to 2014. During 2014, the BDS movement stepped further into the political mainstream and saw major institutions join the boycott, the statement noted. Este resumen se publicó junto con una declaración del Comité Nacional Palestino de BDS con miras a 2014. Durante 2014, el movimiento de BDS dio un paso más en la corriente principal de la política y vio a las principales instituciones unirse al boicot, señaló la declaración. The former South African ambassador to Israel says he'll be returning a certificate informing him that 18 trees had been planted in his honour in an Israeli forest by the Jewish National Fund (JNF) and the Israeli ministry of foreign affairs. Read the Haaretz.com coverage here. An event to be held at a St Andrews hotel, aimed at raising funds for the Friends of the IDF and the JNF, has been cancelled on police advice in the face of serious mobilisations for planned protests. Palestine activists, human rights campaigners and students joined forces to speak out against the inclusion of Friends of the IDF and the JNF in the list of organisations that will benefit from the fundraiser. 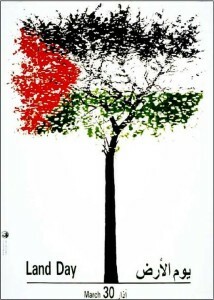 30 March 2013 -- Palestinians are today commemorating with action Land Day, a day in 1976 when Israeli military forces shot and killed six young Palestinian citizens of Israel. These brave youth were among thousands protesting the Israeli government’s expropriation of Palestinian land. 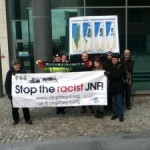 Human rights campaigners have accused the Charity Commission of failing to protect the public interest by allowing the charity status of JNF UK to continue.